Point of Sale with Signature Capture for HIPAA Compliance, Third Party Logs, Charge Accounts, Credit Card Transactions Delivery Tickets and Paid Outs.. Document Patient Screening for Pseudoephedrine Sales !! POSiTrack Rx alerts you to patients who have not signed an acknowledgment of receiving your Notice of Privacy Practice. The interactive signature capture terminal streamlines the process of obtaining those signatures. The same terminal may also be used to obtain signatures for third party logs, in store charge accounts, paid outs, and credit card charges. Barcodes scanned from prescription receipts provide the third party ID, prescription number and patient name for the third party log. The signature is stored with that record and may be retrieved at a later date to verify who picked up the prescription. Individual transactions of cash sales, charges, credits, paid outs, credit card sales may be retrieved at a later date complete with signature. The main entry screen is uncluttered and allows manual entry of non-barcoded items. 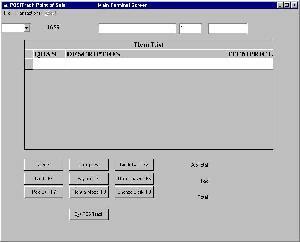 Features an Inventory Information Accounting System (IIAS) to validate purchases made on Flexible Spending Account cards. Help your customers track their Qualified Medical Expenses!! !